Ladies opal and diamond ring. GIA graduate graded. Opal Attributes. - Color intensity: Moderate. - Setting: Bezel and bead set. Ring Attributes. - Total Diamond Weight: 0.48 ct. (calculated). - Finish: Polished. Genuine Baltic Amber. Russian Unique Amber Pendant. This is beautiful 100% natural, old, authentic, genuine Baltic amber. It has a light weight with excellent cut and polishing. AMBER from. Here you are looking at the best amber jewelry of its kind. GIA Kunzite Italian 14K gold Chain Pendant Necklace with a Spring Ring Clasp. Gemstone: Genuine Natural Color Kunzite. GIA Report Number: 5202038666. Total Item Weight approx: 26.1 Grams. The approximate condition of this item is graded on a scale from value 5 (excellent) to value 1 (poor). GIA graduate graded. - Shape and cut: Oval cabochon. - Weight: 7.55 Cts. (calculated). Ring Attributes. - Brilliancy: Good - 50% to 70%. Ring has pre-owned hairline marks and needs a light cleaning. GIA Certified Italian Diamond & Yellow Sapphire 14K Gold Box Chain Pendant Necklace with a Spring Ring Clasp. GIA Report Number: 1192376761. Gemstone: Genuine Diamond. We pride ourselves in carrying high quality estate and antique jewelry. Beautiful ruby 3 CTs in size. Top red color. Certified by GIA. Antique platinum setting Art Deco with over 1 ct in diamonds G and VS. This is a beautiful Ring. Ruby is over 3 CTs and over 1 carat of diamonds for a total of over 4 carats in gems. GIA Certified Purple Garnet & Diamond 14K Two-Tone Gold Ring. Gemstone: Genuine Purple-Red Pyrope-Almandine Garnet. GIA Report number: 5191995795. Total Item Weight approx: 6.7 Grams. Clarity Grade approx: VS1-VS2. Certified Natural Color / GIA Certificate Included! .ANTIQUE VINTAGE 12K YELLOW GOLD FILLED FIRE OPAL PENDANT & 17" CHAIN The pendant with the bale measures 1.00" long. The 12k gold filled chain is 17". Chain has a spring ring clasp. The pendant as well as the spring ring clasp on the chain are hallmarked "1/20 12k GF". The pearls have 3 strands, with a Swarovski Crystals clasp. This is beautiful 100% natural, old, authentic, genuine Baltic amber. It has a light weight with excellent cut and polishing on amber and 925 sterling silver. If you are buying to invest yours hard earned money in amber product, then here is the real Treasure. STUNNING REDUCTION IN PRICE COMPARED TO THE NEW APPRAISAL. This is a interesting little black opal in matrix from Australia, likely from the Lightning Ridge mines. A rare custom made item. It is very clean SI/1 clarity & has J color, but appears even whiter due to the amount of light & sparkle it emits. Along with a couple of blue sapphire accents, this is a dazzler! Condition: Diamond info detailed in report, all stones are intact & look fine. This is beautiful 100% natural, old, authentic, genuine Baltic amber pendant. It has a light weight with excellent cut and polishing. No modified, no reconstructed, no pressed, and no bonded. Baltic from Russia. Gorgeous Gold Plated 7.50"Circles & Balls Chain​ Charm Bracelet for charms. The Bracelet is 7.50" long X .75" wide and weighs 45.68 Grams. Genuine Baltic Amber. Russian Unique Amber Pendant Bee collection. This is beautiful 100% natural, old, authentic, genuine Baltic amber Bee collection. It has a light weight with excellent cut and polishing. Clip on gold tone earrings with large clear center stone surrounded with pearls and rhinestones. New with tags. Amber Bee with silver size:16mm X 22mm. Hand cut honey color amber bracelet,made on state own factory in Russia.The best quality Amber polishing and hand cut from genuine amber stone. Hallmark 925 Sterling silver Amber bracelet. This amazing ring is a discerning collector's dream. A gigantic center stone displays a highly sought after, beautiful Vivid Green Color. Indeed, she may have done a great deal to popularize that connection. Vintage Southwestern Signed RB Sterling Silver Turquoise Stone Cuff Running Bear Bracelet The cuff measures 6.50" around the inside with 5.25" and another 1.25" opening. It could be closed a tiny bit to make it smaller and a tiny bit the other way to make it larger. The Rope Framed Turquoise stone measure 3/4" long X 7/16" wide. 100% Natural Real Honey Cognac color of Russian Antique Amber Necklace with pearl from Baltic Sea Russia. This is beautiful 100% natural, old, authentic, genuine Baltic amber. It has a light weight with excellent faceted cut and polishing WITH PEARL SETTING. It has a light weight with excellent cut and polishing. Made in Russian Federation. 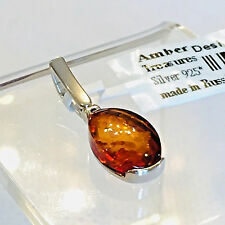 Amber Treasures Designer of Amber in Gold & Silver Jewelry since 1991. Be realistic and cautious on bigger amber pieces for lower prices. This is beautiful 100% natural, authentic, genuine Baltic amber pendant. It has a light weight with excellent hand cut and polishing honey cognac color of amber. Each stone individually polished by hand to the perfection. This is an original product and not copy. Hallmark 925 Sterling silver Amber bracelet. Made in Russian Federation. Material: Natural amber & sterling silver 925 Hallmark. Original 100% natural Amber and stamped with. It weighs 8.8 dwt., and includes a 20" sterling bead and bar chain. It appears to be stamped "Bethlehem" and dates from the 1950's. MID-CENTURY MODERN. BABY & YOUTH SILVER. Bohemian garnet bangle bracelet made with gilt brass and gold filled safety chain. The garnets are rose cut. The bracelet fits a 7 1/2" wrist, it weighs 12.7 dwt., and the piece dates from the 1880's. This is beautiful 100% natural, old, authentic, genuine Baltic amber. It has a light weight with excellent cut and polishing. If you are buying to invest yours hard earned money in amber product, then here is the real Treasure. ANTIQUE Genuine BALTIC AMBER RING Sterling Silver 925 Hallmark, Butterscotch Egg Yolk Honey Cognac hand cut faceted Amber. Made in Russian Federation. Amber here was hand cut and polished. Be realistic and cautious on similar amber pieces for lower prices. RARE, VERY FINE, LARGE, ANTIQUE, NATURAL, UNDYED, POLISHED CORAL BEAD NECKLACE. CERTIFIED BY THE GIA. WHOPPING 159.90 GRAMS. DESIRABLE, REDDISH-ORANGE TONE. THE NECKLACE HAS BEEN RECENTLY RESTRUNG AND RONDELLE-SHAPED BEADS, INDIVIDUALLY HAND-KNOTTED. 100% Natural Real honey cognac color of Russian Antique Earrings with Baltic Amber. This is beautiful 100% natural, old, authentic, genuine Baltic amber. It has a light weight with excellent faceted hand cut and polishing. Baltic from Russia. Here you are looking at the best amber jewelry of its kind. Variety/Type Baltic. Made in RUSSIAN FEDERATION. “X-High quality OLD NATURAL AMBER Stone.This item an excellent Estate Jewelry from THE AMBER FACTORY OWN BY STATE collection since late 1980's. By 6.92 mm. One single cut diamond have small, natural surface imperfection. Ring weight 5.8 grams. The ring size is 6.5 and it can be resized. The ring is hallmarked: 10% IRID.PLAT. which is an early hallmark for platinum and it has been tested for purity.The ring is in perfect condition, does not have signs of wear. 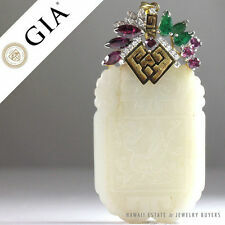 Stunning BeautifulRed Jadeite Jade and Diamond in 18K White Gold Pendant. JADE, JADEITE, AND GEMS. setting and lighting during photographing, we try our best to match up with the actual piece color. Pictures are enlarged to show detail. The ring fits a size 3 finger, it weighs 0.6 dwt., and this is a contemporary piece. BABY & YOUTH SILVER. MID-CENTURY MODERN. SILVER FLATWARE & SILVERWARE. Family Owned & Operated. Inventory#RY4613. This is beautiful 100% natural, old, authentic, genuine Baltic amber. It has a light weight with excellent cut and polishing. Average larger amber beads size 5-7mm 50% rounded. Average small amber beads size 3-4mm. This is beautiful 100% natural,Antique old, authentic, genuine Baltic Amber ring. Here you are looking at the best amber jewelry of its kind. The best way to know if the amber is real and the highest quality, you need only trust the source. 100% NATURAL POLISHED ANTIQUE WHITE BUTTERSCOTCH EGG YOLK COLOR BALTIC AMBER RING. Unique Ring an excellent Jewelry from the Baltic region. Made in RUSSIAN FEDERATION. Must see & touch to appreciate quality of unique pieces of Amber. 100% NATURAL POLISHED ANTIQUE DARK COGNAC HONEY UNIQUE TEXTURE COLORS BALTIC AMBER PENDANT. This is beautiful 100% natural, old, authentic, genuine Baltic amber. Baltic from Russia. Here you are looking at the best amber jewelry of its kind. This is beautiful 100% natural, old, authentic, genuine Baltic amber. It has a light weight with excellent cut and polishing. Baltic from Russia. If you are buying to invest yours hard earned money in amber product, then here is the real Treasure. 100% NATURAL POLISHED ANTIQUE HONEY COGNAC COLOR BALTIC AMBER PENDANT. Baltic from Russia. THE LARGER THE AMBER PIECE, THE HIGHER THE COSTS & IF IT IS GENUINE NATURAL INCLUSIONS HAND CUT AMBER, GRAB IT AND KEEP IT IN YOUR COLLECTION, YOU'VE GOT A TREASURE. A beautiful 29 inch antique Art Deco 15K gold, diamond and rock crystal Grade A natural jadeite bead necklace, with GIA certificate. This stunning and long Art Deco necklace has 72 wonderful gently graduating light green translucent Grade A natural jadeite beads tied with knotted green silk while the center has 25 lovely graduating glittering rock crystal rondelle beads used as spacers. The necklace has a solid 15K white gold clasp with 8 near colorless rose cut natural diamonds and a central larger near colorless single cut natural diamond. The clasp is stamped '15ct'. The necklace is accompanied with a GIA report stating the translucent light green beads are of natural color and have not been treated. The necklace measures approximately 29 inches in total length. The beads measure approximately 9.7mm graduating down to about 7.1mm. There are different types of appraisals. YOU CAN ALSO TEST CZ'S AND GEMSTONES AND YOU WILL GET A GREEN OR YELLOW LIGHT READING. IT'S IMPOSSIBLE TO MAKE A MISTAKE! This amazing natural black diamond is 2.25ct and it is 8mm.